A very special Dance choreography by Laurel Gray; described as a mosaic of Eastern women’s gestures and emotions that speaks for those who have no voices. This dance has been performed all over the world. So so beautiful. Laurel is taking a lot of time out of her busy schedule in WA DC to be with us during the parade week. So I thought it important to schedule a workshop for her while she’s here. We get to study with a master and it puts some resources in her pocket. I realize many people work on week days (but not everyone). Traffic is much easier in the afternoon. Please talk it up to your other dance friends it’s not limited to just parade dancers. Internationally recognized dance scholar, choreographer, and performer, Laurel Victoria Gray has devoted her life to mastering dances from Silk Road cultures and beyond. She combines her degrees in history with decades of field research and teaches dance at George Washington University and George Mason University. Her scholarly articles have appeared in many publications including the Oxford University Press International Encyclopedia of Dance, the World Encyclopedia of Contemporary Theater, the Encyclopedia of Modern Asia, the Encyclopedia of Women in Islamic Culture, Facts on File, Dance Magazine, and Azerbaijan International as well as foreign dance journals. Known as ‘the pioneer of Uzbek dance in America’, Laurel founded the award-winning Silk Road Dance Company in 1995 with the goal of fostering “cultural understanding through Beauty and Delight.” The Fulbright Association selected her to deliver the 2009 Selma Jeanne Cohen International Dance Scholar Lecture. In 2007, she was awarded on honorary doctorate by the Ministry of Culture of Uzbekistan for her work on Central Asian dance. She is the recipient of the 2006 Metro DC Dance Award for Excellence in Costume Design; the 2003 Kennedy Center Local Dance Commissioning Project Award; and the International Academy of Middle Eastern Dance (IAMED) Awards for Best Choreographer (2003) and Best Ethnic Dancer (1999). In 1990, she was an education outreach instructor for New York’s City Center Theater, introducing thousands of middle school students to Soviet Georgian dance. 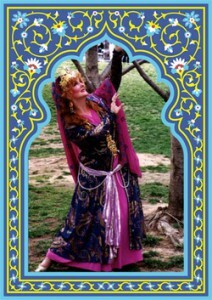 For several years she gave instruction in Persian dance at the Iranian Community School in Vienna, Virginia. In 1984, Dr. Gray founded the Uzbek Dance and Culture Society and in 1994 established the annual Central Asian Dance Camp. Gray has lectured at the First and Second International Conferences on Middle Eastern dance as well as the 2006 Inaugural Conference on Near and Middle Eastern Dance at Connecticut College. She presented a workshop on women’s dance of the Islamic World for the National Dance Education Organization 2008 conference. In 1984, Dr. Gray founded the Uzbek Dance and Culture Society and in 1994, established the annual Central Asian Dance Camp. She has traveled to Uzbekistan twelve times, living there for two years at the invitation of Tashkent’s State Academic Bolshoi Theater and appearing on television dance programs over a dozen times. She was a member of the jury for the 1997 Sharq Taronalari Festival and for the 1993 Uzbekistan Puppet Theater Festival. Concert works include: Hooray for Bollywood (2009); Raqaset Shaabia: Arab Folklore (2009); Legends of the Silk Road (2008); Gul Bahaar: A Celebration of Uzbek, Indian and Persian Dance (2007); The Golden Road to Samarkand(2006); Haft Paykar: Seven Beauties (2005); Egypta: Myth, Magic, and Mystery (2003); Remembering the Legends(2001); The Lion and the Sun: Dances of the Old Persian Empire (1998).